The ML 805 bin lifter fills the need for a lifter combining the best attributes of both a low and high-level lifter. 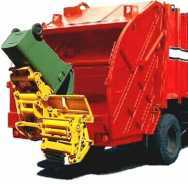 In normal low-level lifters the compactor cannot run when bins are being tipped, while high-level lifters are not suitable for large amounts of bagged refuse owing to their height. Further, high-level lifters suffer from poor ground clearance when lowered and are thus susceptible to damage, especially when reversing through dips. The ML 805 solves these problems by having high ground clearance, a low sill, and a high tipping level while being able to handle two- and four-wheeled plastic bins and steel (Sprico type) bins of 1100 litres. 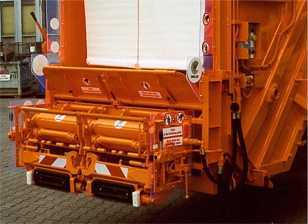 When the combs are split for the smaller two-wheeled bins, cycle times of 8 seconds are achieved with a hydraulic supply rate of less than 30 litres per minute enabling your vehicles to be significantly quieter and more fuel-efficient. 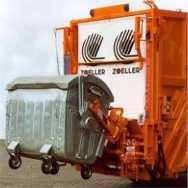 The two sides of the lifter are independently controlled when handling two-wheeled bins. On opening the trunnion arms to handle the larger four-wheeled bins, the two lifter sections are mechanically locked. Copyright © 2016 Mechlift (Pty) Ltd. All rights reserved.